How could anyone see NKT as a serious religious organization? NKT claims its heritage from Tibetan Buddhism, but also claims it is not a form of Tibetan Buddhism, further claiming "Representatives of the NKT, such as teachers and managers, are not however permitted to invite Lamas from different traditions to teach...it is unlikely that the three NKT study programmes will ever be adopted at the Gelugpa monasteries in India, or that Western NKT teachers, lay or ordained would ever be invited to teach Dharma at Gelugpa monasteries or centers...What works for Tibetans does not easily translate for Westerners and the presentation of the teachings, which has been carefully designed for Westerners, differs widely from the Geshe program taught in the monasteries." "Carefully designed for Westerners" for money and politics. Of course, Tibetans do not support NKT's political battle with Tibet. "I feel as a Shugden practitioner that WSS/NKT gives all Shugdenpas a bad name and I don't want anything to do with their political agenda funded by the Chinese." NKT claims about Kelsang Gyatso that "His epic achievement has been in transplanting Kadampa Buddhism from the snowy mountains of Tibet into an entirely alien Western soil so that it becomes a natural part of the landscape of our societies." NKT 'transplanted' its mutation designed for western deification of a controversial angry Tibetan ghost (Shugden) often deployed for material gain and harming disbelievers and those Buddhist schools outside a particular sect. NKT's mutation shocks most Tibetans. According to an NKT support web site October 19, 2010, "Dorje Shugden practitioners are still ostracised and vilified by the majority of Tibetans." NKT despises this religious freedom of Tibetans to express their concerns with Shugden and NKT's western cult and has written 2 books demeaning Tibetan Buddhists as corrupt. NKT claims that it has introduced hundreds of thousands to Buddhism, though NKT retains relatively few of those who visit NKT. Thus, NKT likely turns the most people away from Buddhism. Moreover, NKT actively turns away many from NKT by throwing them out of their government-subsidized apartments and banning them from further participation. Many leave NKT devastated - emotionally, spiritually and financially - from NKT's abusive treatments and tricks with spirituality. NKT promises that your money, labor and total devotion to its renegade founder will fast track you to infinite happiness and Buddhahood. In fact, however, 20 years of NKT existence has yet to deliver as advertised. Instead, NKT undermines spirituality, replacing it with deeper selfishness and anger. 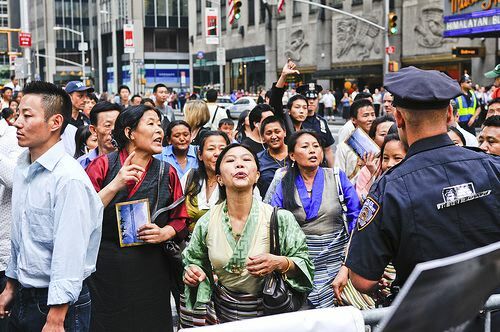 Nevertheless, Kelsang Gyatso later invigorated his political campaign against Tibet, sponsoring protests around the world, beginning again in 2008 and demoting NKT teachers who disagreed with Kelsang Gyatso's political campaign. According to NKT, it boils down to "Shugden Supporters...vs the Tibetan establishment." Because Kelsang Gyatso sees himself as the the protector of Shugden in the west, he created in 1996 his campaign against Tibetan affairs. Kelsang Gyatso and NKT blame many but hold special contempt for the Dalai Lama's views on Shugden worship. "The Dalai Lama's hostility to the practice had been an open secret in Tibetan exile society since the 1970s, and especially since the death of his teacher and famous Dorje Shugden proponent Kyabje Trijang Rinpoche in 1981. However, it wasn't until 1996 that the rest of the world became aware of the issue." "A lot of young people go into the NKT from a drug-orientated life and find the emotional force of the cult is tremendously compelling." "Some small group in our NKT society engage in meaningless activity on the internet, not only Sangha, some lay. This is incorrect. 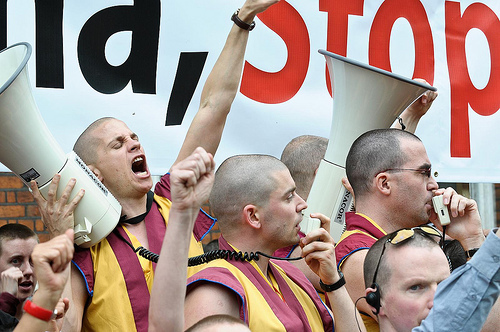 We are Kadampa practitioners, Kadampa Teachers. Why are we enjoying meaningless activity, discussion? We can have a meaningful discussion with pure practitioners or senior practitioners, Teachers. There is no meaning in talking about silly things publicly on the internet. Instead, make meaningful discussion with our pure practitioners, senior Teachers. Please give my message to the individuals of this group. Stop this kind of actions. Gen-la Khyenrab, give my message in email or writing. Stop meaningless discussion on the internet. If you wish, do meaningful discussion with senior Teachers or pure practitioners, or meaningful discussion with your Teacher. No meaning engaging in silly question and answers on the internet. Please Gen-la Khyenrab, pass my message. I am telling you for your purpose and our society's purpose. In this way, keep individuals and society pure and show very good example." To Kelsang Gyatso and NKT, Shugdenism is their political tool against Tibetan affairs. Although Kelsang Gyatso told his followers to refrain from the Internet, he and his followers acted otherwise, proceeding to create numerous web sites and thousands of blog posts aggressively attacking Tibetan Buddhists and ex-NKT members and clergy on several web sites. For example, consider this NKT web site, which has defamed specified Buddhists by asserting that they suffer psychiatric instability, presuming to diagnose medical conditions of these individuals and then broadcast NKT's diagnosis around the world in NKT's attempt to discredit them and their adverse experiences with NKT, feeding Kelsang Gyatso's ego and arrogance and inspiring his followers to behave likewise. Kelsang Gyatso and NKT have a strange habit of threatening lawsuits against Buddhists and the media. Are any of these established traits of NKT appropriate? Other than (other) radical fundamentalist movements, what other religious organizations perform such campaigns? How could anyone, including remaining NKT members and clergy, endorse NKT's attacks against Buddhists...in the name of NKT's distorted-though-profitable brand of 'Buddhism' and display such a negative picture of Buddhism to the general public?